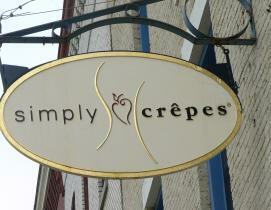 CANANDAIGUA -- The Grape Crêpe will be returning on the menu at Simply Crêpes Restaurant in Canandaigua. This seasonal specialty features grape pie filling from Arbor Hill Grapery and Winery and the legendary Cindy’s Pies in Naples. The Grape Crêpe is made with the restaurant&apos;s hand-crafted sweet cream and house-baked crumble topping and is stuffed with locally grown grapes. Nicole Heroux, owner and director of Business Development at Simply Crepes, is proud of the commitment Simply Crêpes has made to the local community. “We are very excited to be in this wonderful Finger Lakes region and have the abundance of great products and people at our finger tips. Our fall menu showcases many local farmers and industries,” she said. The Grape Crêpe will be on the menu at Simply Crepes for the fall season. Simply Crêpes is owned and operated by the Héroux family with locations in Pittsford and Canandaigua, New York, and Raleigh, North Carolina. Their full menu of crêpes ranges from the more traditional breakfast and dessert crêpes to the delectable savory entrée crêpes and healthy, gluten-free crêpe options. Their services include delivery, on-site catering, and hosting meetings, parties and tour groups. Simply Crepes is the winner of the 2013 Foodie Award for the Finger Lakes Food Revolution. Learn more about Simply Crêpes at www.simplycrepes.com. Simply Crêpes is at 101 South Main Street, Canandaigua, NY 14424, 585-394-9090.Hours are: Monday-Saturday, 7:30 am to 9 pm; Sunday 7:30 am to 3 pm (Brunch Buffet 9 am to 2 pm).